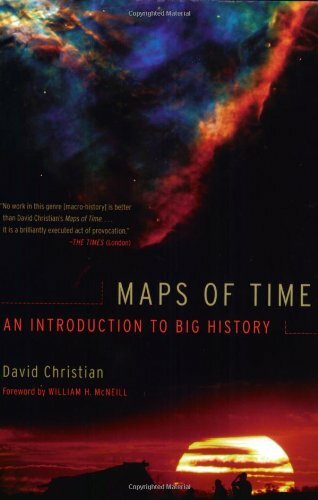 David Christian, a trained historian, is one of the leading proponents of the relatively new concept of Big History, which I view as a sea-change in the way humans will begin to view not only the world but our place in it and what we might expect to come in the future. His work presents a truly monumental and profound thesis and a drastically new framework for where humankind fits into the universe. Of the broad variety of works I’ve read in the past several decades, it is simply one of the most interesting and cohesive theses I’ve come across, and I highly and unreservedly recommend it to everyone I know. I’d put it on par or above works like Jared Diamond’s Guns, Germs, and Steel and Matt Ridley’s The Rational Optimist among others for its broad impact on how I now view the world. For scientists and researchers it has the potential to be the philosophical equivalent of The Bible and in fact, like many religious texts, it is in effect a modern day “creation myth,” albeit one with a scientific underpinning. Christian’s work was initially brought to my attention by an article in the Chronicle of Higher Education by Jeffrey R. Young in which he mentioned that Bill Gates was a big fan of Christian’s work and had recommended it himself at a TED conference. (Gates is now also a financial supporter of Christian’s Big History Project.) I myself was aware of the Learning Company’s generally excellent coursework offerings and within a few weeks got an audio copy of the course of forty-eight lectures to listen to on my daily commute. I’ve now devoured both his rather large text on the subject as well as a lecture series he created for a course on the subject. Below are brief reviews of the two works.The magnum written opus Maps of Time: An Introduction to Big History is an interesting change of reference from a historical perspective combining the disciplines of physics, cosmology, astronomy, geology, chemistry, microbiology, evolutionary theory, archaeology, politics, religion, economics, sociology, and history into one big area of contiguous study based upon much larger timescales than those traditionally taken in the study of historical time periods. Though it takes pieces from many disciplines, it provides for an interesting, fresh, and much needed perspective on who humans are and their place in not only the world, but the entire universe. By looking at history from a much broader viewpoint (billions of years versus the more common decades or even just a few centuries) one comes away with a drastically different perspective on the universe and life. I’d highly recommend this to any general reader as early as they can find time to read through it, particularly because it provides such an excellent base for a variety of disciplines thereby better framing their future studies. I wish I had been able to read this book in the ninth or tenth grade or certainly at the latest by my freshman year in college – alas the general conception of the topic itself didn’t exist until after I had graduated from university. Although I have significant backgrounds in most, if not all, of the disciplines which comprise the tapestry of big history, the background included in the book is more than adequate to give the general reader the requisite introductions to these subjects to make big history a coherent subject on its own. This could be an extremely fundamental and life-changing book for common summer reading programs of incoming college freshman. If I could, I would make it required reading for all students at the high school level. Fortunately Bill Gates and others are helping to fund David Christian’s work to help introduce it more broadly at the high school and other educational levels. Within David Christian’s opus, there is also a collection of audio lectures produced by The Learning Company as part of their Great Courses series which I listened to as well. The collection of forty-eight lectures is entitled Big History: The Big Bang, Life on Earth, and the Rise of Humanity (Great Courses, Course No. 8050). It provides a much quicker philosophical overview of the subject and doesn’t delve as deeply into the individual disciplines as the text does, but still provides a very cohesive presentation of the overall thesis. In fact, for me, the introduction to the topic was much better in these audio lectures than it was in the written book. Christian’s lecture style is fantastic and even better than his already excellent writing style. Because of the scale on which we look at the past, you should not expect to find in it many of the familiar details, names, and personalities that you’ll find in other types of historical teaching and writing. For example, the French Revolution and the Renaissance will barely get a mention. They’ll zoom past in a blur. You’ll barely see them. Instead, what we’re going to see are some less familiar aspects of the past. … We’ll be looking, above all, for the very large patterns, the shape of the past. In the audio lectures Christian highlights eight major thresholds which he uses as a framework by which to view the 13.4 billion years of history which the Universe has presently traversed. Then within those he uses the conceptualization of disparities in power/energy as the major driving forces/factors in history in a unique and enlightening way which provides a wealth of perspective on almost every topic (scientific or historical) one can consider. This allows one to see parallels and connections between seemingly disparate topics like the creations of stars and the first building of cities or how the big bang is similar to the invention of agriculture. I can easily say that David Christian’s works on big history are some of the most influential works I’ve ever come across – and having experienced them, I can never see our universe in the same naive way again. Given how profound the topic of big history is, I’m sure I’ll be writing about and referring to it often. Posts in relation to it can be found here with the tag: “big history“. In Big History and the Future of Humanity, Fred Spier has built on an earlier work of his and on the work of Eric Chaisson to produce what is currently by far the most sophisticated attempt to construct a thematic scaffolding for big history. He carefully links the idea of increasing complexity with the associated themes of energy flows and the idea of goldilocks conditions—the notion that complexity can increase only under very special conditions and within quite exacting “boundary conditions.” Here are broad theoretical ideas that can help give greater depth and coherence to the story told within big history. Introduction: A Modern Creation Myth? Accounts of the past that focus primarily on the divisions between nations, religions, and cultures are beginning to look parochial and anachronistic—even dangerous. Chaisson, Eric J. Cosmic Evolution: The Rise of Complexity in Nature. Cambridge, Mass. : Harvard University Press, 2001. Margulis, Lynn, and Dorion Sagan. Microcosmos: Four Billion Years of Microbial Evolution. London: Allen and Unwin, 1987. Spier, Fred. The Structure of Big History: From the Big Bang until Today. Amsterdam: Amsterdam University Press, 1996. This is very much how modern nuclear physics views the idea of a vacuum: it is empty but can nevertheless have shape and structure, and (as has been proved in experiments with particle accelerators) “things” and “energies” can pop out of the emptiness. Perhaps this is where dark matter and energy are hiding? The idea that form and matter are different expressions of the same underlying essence was proposed by the Italian Giordano Bruno as early as 1584, in a book called Concerning the Cause, Principle, and One. Even in the densest part of the galaxy, the disk, regions of empty space normally contain only about one atom in each cubic centimeter. But in the earth’s atmosphere, there may be 25 billion billion molecules in the same space.15 And pouring though this matter is the energy emitted every second by the Sun. In other words, human history has taken place in a pocket of the universe that is dense in matter and packed with energy. It is the extraordinary richness and complexity of this environment that made life possible. A Danish scientist, Nicholas Steno, first argued that fossils were the remains of organisms that had once lived on earth. Charles Lyell first stated clearly what came to be known as the principle of uniformitarianism. As the English philosopher Francis Bacon pointed out in 1620, it was easy to see from these maps that the continents looked like pieces of a jigsaw puzzle. This similarity was most striking when the west coast of Africa was matched up with the east coast of South America. The idea that the continents really had drifted apart was given a thorough scientific basis in a book called The Origin of Continents and Oceans, written in 1915 by a German geographer, Alfred Wegener. uppermost layer of the earth (the lithosphere) consists of a number of rigid plates, like a cracked eggshell. There are eight large plates and seven smaller ones, as well as smaller slivers of material. Darwin rarely used the term evolution, perhaps because it seems to imply some sort of mystical force that drives biological change in particular directions and thus would contradict his own view of biological change as a more open-ended process. Erasmus Darwin, suggested that species evolved so as to adapt better to their environments. In a book first published in 1809, the French naturalist Jean-Baptiste Lamarck suggested a possible mechanism. Perhaps minor changes acquired during a creature’s lifetime could somehow be passed on to its descendants. Time we spend in the gym does not guarantee that our children will be fit. Evolution works in fits and starts, according to the modern theory of “punctuated evolution,’ which was proposed by Niles Eldridge and Stephen Jay Gould in 1972. 1920s by Alexander Oparin and J. B. S. Haldane, uses the basic ideas of evolutionary theory to explain not just the evolution of life on earth but also its initial appearance. But precisely how chemical evolution generated the first living organisms remains unclear. To understand these difficulties, we must break the problem into several levels. First, we need to explain how the basic raw materials of life were created: the chemical level. Second, we need to explain how these simple organic materials were assembled into more complex structures. Finally, we need to explain the origins of the precise mechanisms of reproduction encoded in the DNA that is present in all living organisms today. At present, we have reasonably good answers to the first question; we have plausible answers to the second question; and we are still puzzled by the third question. Harold Urey and his graduate student, Stanley Miller. Fred Hoyle and Chandra Wickramasinghe have argued that Earth was seeded with life from outside. This theory is known as Panspermia. A. G. Cairns-Smith has suggested that in shallow water, tiny crystals of clay may have provided a template for the formation of more complex molecules. Humans do not have the 60,000 to 80,000 genes we once believed were necessary to construct us but half that number, about 30,000. Roundworms have two-thirds as many genes as us (ca. 19,000), and fruit flies just under half (ca. 13,000); even Escherichia coli, a bacterium that inhabits our gut, may have as many as 4,000 genes. So, though constructing large organisms is tougher than constructing small organisms, the difference is not as great as we once imagined. It would seem that we’re not really becoming that more complex from a relative perspective here. What is the next major jump on the hockey stick? The first extensive fossil evidence of multicellular organisms dates from the Ediacaran era, ca. 590 million years ago. But the fossil record of multicellular organisms really becomes abundant during the Cambrian era, from ca. 570 million years ago. In the middle of the nineteenth century, the German biologist Ernst Haeckel suggested that all single-celled organisms be classified within a separate kingdom of Protista. Then, in the 1930s, biologists realized that there was a fundamental difference between cells with nuclei and those without. As a result, they began to divide all organisms into two distinct kingdoms, the Prokaryota (organisms whose cells had no nuclei) and the Eukaroyta (organisms whose cells had nuclei). In some systems, the Eukaryota also include all multicellular organisms. In the second half of the twentieth century, powerful arguments emerged for the creation of separate kingdoms for fungi and for viruses (which are so simplified that they cannot even reproduce without hijacking the metabolic systems of other organisms). In the 1990s, Carl Woese proposed a new large classification to distinguish between the archaea and other forms of bacteria. Like all prokaryotes, archaea do not have nuclei; but unlike other prokaryotes they take in energy neither from sunlight nor from oxygen but from other chemicals. John Maynard Smith and Eörs Szathmáry’s The Origins of Life (1999) is a history of life on Earth, constructed around the central idea of the evolution of complexity. Net primary productivity (NPP) is that portion of energy from sunlight that enters the food chain through photosynthesis and is turned into plant material. This means that the impact of human history will be visible on scales of at least a billion years. new ways of extracting resources from their environments. We have seen that the emergence of new forms of complexity always involves the creation of large structures within which previously independent entities are locked into new forms of interdependence and new rules of cooperation.7 Following this hint, we should expect to find that the transition to human history is primarily marked not by a change in the nature of humans as individuals but rather by a change in the way individuals relate to each other. In an article first published in 1967, two biochemists working in the United States, Vincent Sarich and Alan Wilson, argued that much genetic change is subject to similar rules. It is possible that tool use evolved through a process known as Baldwinian adaptation (named after the nineteenth-century American psychologist who first described it systematically). This is a form of evolutionary change that appears to combine Darwinian and cultural elements, because behavioral changes lead to changes in an animal’s lifeways, thereby creating new selective pressures that lead, over time, to genetic changes. the so-called Levallois or Mousterian tools. Two factors stand out: the volume and variety of the information being pooled, and the efficiency and speed with which information is shared. All of recorded human history has taken place within the Holocene interglacial. In fact, most of human history (chronologically speaking) has taken place in communities quite innocent of state power. Even in the villages of the early agrarian era, for most people, most of the time, the important relationships were personal, local, and fairly egalitarian. Most households were self-sufficient, and people dealt with each other as people rather than as the representatives of institutions. irrigation could raise agricultural productivity decisively, which is why irrigation has been one of the most revolutionary of all technological innovations. But population growth itself counts as a form of intensification, for in the era before fossil fuels, the energy resources available to human societies came mostly from human or animal muscle power. Inequality is what all top-down theories of state formation predict. as the sociologist Émile Durkheim first suggested, our thinking about the way the universe works often mirrors the way our own societies work. But most were used as sources of stored energy for their owners: where human labor power was as important a source of energy as oil is today, controlling energy meant controlling people. To make slaves more amenable to control, they were often separated at birth from their families. And, like domestic animals, many were deliberately kept in a state of infantile dependence that inflicted a sort of psychic amputation on them—they remained like children, and their helplessness made them easier to control. Both animal and human slaves could be controlled best if kept economically and psychically dependent on their owners. Outside the cities, they usually had little authority over the more localized forms of violence used to collect taxes, prosecute offenders or deal with banditry, or right local injustices. These powers were exercised by local elites or kinship groups. For most individuals, the righting of wrongs remained the duty of the household or kin group, which might seek the support of local patrons or officials. Wolf calls “tributes.” This is justification for regarding societies with states as an entirely new type of social structure. Wolf treats the emergence of what he calls “tribute-taking” societies as a major transformation in the lifeways and the organization of human societies. They include the emergence of dense populations, which generated a complex division of labor that posed new organizational problems, led to increased need for conflict resolution and to more frequent warfare, and encouraged the building of large monumental buildings as well as the creation of some form of writing. The demographic dynamism introduced into human history by agriculture ensured that sooner or later, humans, like termites, would face the novel challenge of living in dense communities of their own species. For all the local differences, the solutions humans found in different parts of the world turned out to be remarkably similar to each other—and also strikingly similar to those found by termites and other social insects. Marvin Harris’s classic essay, “The Origin of Pristine States” (1978). we can think of four main types of societies in this era: three—foragers, independent farmers, and pastoralists—lack states; one—agrarian civilizations—has states. World historians have become increasingly sensitive to the importance of large systems of interaction, and have often analyzed them using the notion of world-systems. Immanuel Wallerstein, the originator of such theories, argued that particularly in the modern era, it was necessary to analyze not just particular nations or civilizations, but rather the larger networks of power and commerce in which they were entangled, because these networks explained features that could not be explained solely from the internal history of particular regions. Wallerstein called these networks “world-systems,” even though they did not literally embrace the entire world, on the grounds that in many regards they functioned as separate worlds. Centers of gravity gave structure and shape to large networks of exchange, while hub regions were more lightweight and were more easily transformed by the exchanges that swept through them. So it was often in hub regions that significant innovations first became important because here was where they could have the greatest impact, while the mass and momentum of centers of gravity ensured that those regions normally changed more slowly. Rein Taagepera has tried to measure the areas ruled by “imperial systems” of Afro-Eurasia at different dates. three other factors shaped the pace and nature of innovation in this period: population growth, the expanding activity of states, and increasing commercialization and urbanization. One reason for their immense influence was the overwhelming importance of the agrarian sector. Where most forms of production relied on organic materials and energy sources, agricultural output set limits to the production not just of foodstuffs but also of clothing, housing, energy, productive implements, and even parchment and paper.33 Because agriculture was the main motor of economic growth in the agrarian era, rates of innovation in agriculture dominated medium-term economic, political, and even cultural cycles. The most stable states and the wisest rulers protected the productive base of their societies by taxing lightly, maintaining basic infrastructure, upholding law and order, and encouraging growth in rural populations and agricultural output. Powerful states spent freely on large prestige projects, including cities such as the Achaemenid capital, Persepolis. Such projects were designed to overawe subjects and rivals, but they also provided employment and attracted merchants and artisans. In Muscovite history, the reign of Ivan the Terrible offers a horrifying example of the dangers of excessive predation. First, elites in tribute-taking societies had to be specialists in coercion and management rather than in production. as Joel Mokyr has argued, technological innovation is unlikely to happen quickly where those who work lack wealth, education, and prestige, and those who are wealthy, educated, and have prestige know nothing about productive work. Thus urbanization itself dampened population growth, and it did so most decisively when cities grew fastest. Though tributary states normally tolerated and sometimes encouraged commerce, their predatory methods and willingness to resort to force were ever-present threats to the freedoms needed for trade to flourish. There was therefore a fundamental long-term conflict between the methods of tribute takers and those of merchants; and as long as tributary elites dominated political systems, this conflict limited the productivity-raising potential of commercial activity. Interesting in light of Civility for P.M. Forni. A system of knowledge that is good at manipulating the material world is exactly what we need. Without such knowledge, we could not possibly support a human population of 6 billion. Necessity is not always the mother of invention. in Britain iron makers had tried to use coal for almost two centuries before Abraham Darby showed them how to use coke in the early eighteenth century. the very nature of most premodern states suggests that as a general rule, in agrarian civilizations tribute-taking generated more wealth and certainly more power than commercial exchanges. This differential helps us understand what might at first appear puzzling: though commercial networks are as old as agrarian civilization, their impact on rates of innovation has been limited until the past two or three centuries. Why, then, did commercial exchanges suddenly become so much more significant in the modern era? Did they reach some critical threshold? And what then is the next threshold? For think of what the Internet is doing to the entertainment industry and their reticence to go along with it. Speaking generally, it is the steepness of this gradient of wealth that accounts for capitalism’s remarkable dynamism, just as the large temperature gradient between the Sun and the space surrounding it drives complex processes on Earth. is the steepness of the gradient that drives wealth so efficiently through capitalist societies and that helps explain why, paradoxically, modern states have to be so much larger and more complex than the states of the tributary world. So the onus is on the workers to ensure that their labor is productive enough to find a buyer. In this way, the economic lash can stimulate genuine, even creative, self-discipline, whereas the overseer’s whip can generate no more than grudging conformity. J. L. Anderson’s Explaining Long-Term Economic Change (1991) is a useful introduction to the theoretical literature. Robert Lopez, has called the “commercial revolution of the Middle Ages” a fundamental turning point in modern world history. This quote about 2nd century BCE China sounds a lot like modern day China. this process was completed by 1279 after the conquest of South China by the Mongols under Kublai Khan. After reunification, two of the three conditions encouraging states to support commercialization (small size and intense rivalries) vanished, and the third (easy access to rich trading systems) lasted only slightly longer. Charles Tilly’s Coercion, Capital, and European States, AD 990–1992 (rev. ed., 1992). Indeed, Spain depended so heavily on American silver that when the supply ran out in the seventeenth century, its commercial and political influence declined. wealth. The mercantilist policies of European states in the seventeenth century—such as the Navigation Acts of the English commonwealth, which protected British commerce within British colonies—are good examples of new government attitudes toward commerce and the actions that these changes encouraged. Also illustrating this trend is the proliferation throughout Europe of patent laws, which were pioneered in Venice in the fifteenth century. Governments also began to promote innovation through the founding of scientific societies or the offering of prizes. Over time, commercialization transformed traditional tributary elites. Such transformation was most likely to occur when demands on elite incomes rose sharply in environments where commercial revenues were available for the taking. The English wool trade offers a classic example, for it tempted landowners to clear the land of tenants and replace them with sheep, particularly in the sixteenth century, when new land became available as a result of the dissolution of the monasteries. For most rural dwellers, these changes were catastrophic. This is now what is happening in most of the rest of the world now. The appearance of societies in which most people depended entirely on markets for their subsistence was a new phenomenon, and it gave a tremendous stimulus to commercial production of goods of mass consumption. In 1718, a new owner, Thomas Lombe, in an early example of planned industrial espionage, stole techniques already in use in Italy to set up an improved factory. Where literacy spread, knowledge became more abstract and less personal, and abstract knowledge began to acquire an authority quite independent from the prestige of particular teachers. In the nineteenth century, beginning in Germany, science itself began to be incorporated into entrepreneurial activity as companies set up laboratories specifically to raise productivity and profits. By the late nineteenth century, scientific research was taking a leading role in processes of innovation that might have simply petered out if they had continued to rely on the technical and practical skills of individual entrepreneurs and artisans. Think about how this is done now and how much of it is done by universities instead of by industry. Where is his innovation happening in the future? The modern world is ruled by larger and more impersonal forces, from faceless bureaucracies to abstractions such as “inflation,” or “the rule of law.” Where abstract forces take over the work of coercion from the landlord, the executioner, and the overseer, it is not surprising that there should emerge cosmologies ruled by equally abstract forces. Charles Tilly, Coercion, Capital, and European States, AD 990–1992 (rev. ed., 1992), is good on some of the political changes associated with the Industrial Revolution. During the “great depression” of the 1870s, it became apparent for the first time that economic growth could falter because of overproduction as well as underproduction. Over the following decades, it became clear that in a world of steadily increasing productivity, the problem of finding (or creating) markets would shape the rhythms of economic activity much as the problem of insufficient productivity had done in the agrarian era. As a result, the modern era is dominated by cycles of activity with a different (normally a shorter) periodicity, which we know as business cycles. Indeed, lifestyles have changed so greatly that they may be exerting a significant evolutionary impact on human bodies. The tensions and dislocations of the hurricane of change affecting the entire globe will ensure that conflict remains endemic, and modern weaponry will ensure that local conflicts continue to cause great suffering. it is better than doing nothing at all, just as studying the form at a racetrack is better than tossing a coin. In the long run, you will end up with more money if you study the form. But the patterns we detect are really there, and their existence is one of the great puzzles of the universe. Why is there order of any kind? And what rules allow the creation and evolution of ordered structures? On Earth, the temperature differential between our sun and surrounding space provides the free energy needed to create most forms of complexity, including ourselves; energies created early in the history of our solar system drive the internal heat battery of Earth, which drives plate tectonics. These differentials enable energy to flow, and energy flows make patterns possible. And given enough time, the mere possibility of pattern makes it likely that patterns of many different kinds will eventually appear. After the first problem—explaining how order of any kind is possible—is addressed, the second problem remains. How did complex entities emerge, and, once they had emerged, how did they sustain themselves long enough to be noticed by us (or to be us)? Paradoxically, the tendency toward increasing entropy—the drive toward disorder—may itself be the engine that creates order. The drive toward disorder seems to create new forms of order, just as the energy of falling water can cause droplets of water to splash upward, or a river’s current can create eddies in which small amounts of water flow against the main current. Roughly speaking, the more complex a phenomenon is, the denser the energy flows it must juggle and the more likely it is to break down. So we should expect that as entities become more complex, they become less stable, shorter-lived, and rarer. Perhaps even a slight increase in complexity can sharply increase their fragility and, therefore, their scarcity. What we can do is to describe some of the ways in which complex structures emerge. The fundamental rule seems to be that complexity normally emerges step by step, linking already existing patterns into larger and more complex patterns at different scales. “Leibig’s Law of the Minimum . . . states that populations will be limited by critical resources (e.g., water) that are in shortest supply” (Allen W. Johnson and Timothy Earle, The Evolution of Human Societies, 2nd ed. [Stanford: Stanford University Press, 2000], pp. 14–15). articles, “Immunological Time Scale for Hominid Evolution”; it was published in Science, 1 December 1967, pp. 1200–1203. There is a good short survey of theories of growth in J. L. Anderson, Explaining Long-Term Economic Change (Basingstoke: Macmillan, 1991); and see the survey in Mokyr, The Lever of Riches, chap. 7 (“Understanding Technological Progress”). Editor’s Note: Data relating to reading progress was added to this post on 10/21/16. Data relating to highlights, quotes, and marginalia added on 10/23/16.